Buddhism during the Tang Dynasty (618-907) in China underwent significant transformations following the introduction of Esoteric Buddhism or Mantrayāna, starting in the early eighth century. An important element in this respect was the Buddhist practice of Indian astrology, which was initially utilized for timing of rituals. Buddhist use of foreign astrology prompted further widespread interest in astrology and the casting of horoscopes in Chinese society. Around the year 800, the art of horoscopy was translated into Chinese through Iranian intermediaries. Buddhists appropriated horoscopy for their own purposes, but also tailored ritual magic from multiple sources (Indian, Daoist, and Iranian) as a means of mitigating negative planetary influences. 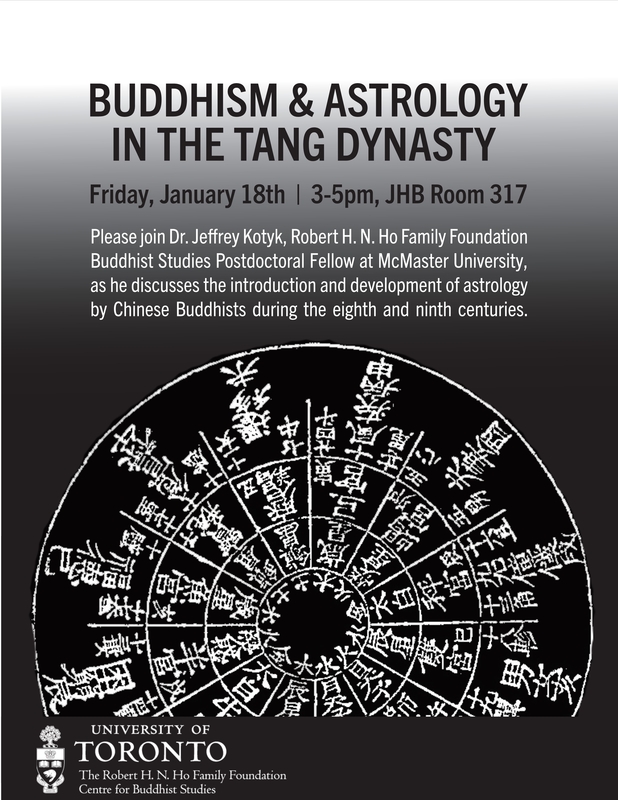 This talk will examine the Chinese Buddhist practice of astrology as well as the related iconography and rituals. Jeffrey Kotyk is Robert H. N. Ho Family Foundation Buddhist Studies Postdoctoral Fellow based at McMaster University. For more information please write to buddhiststudies@utoronto.ca. The event is sponsored by the Robert H.N. Ho Family Foundation Centre for Buddhist Studies, University of Toronto.